Welcome to your complete guide to the best toys for German Shepherds! 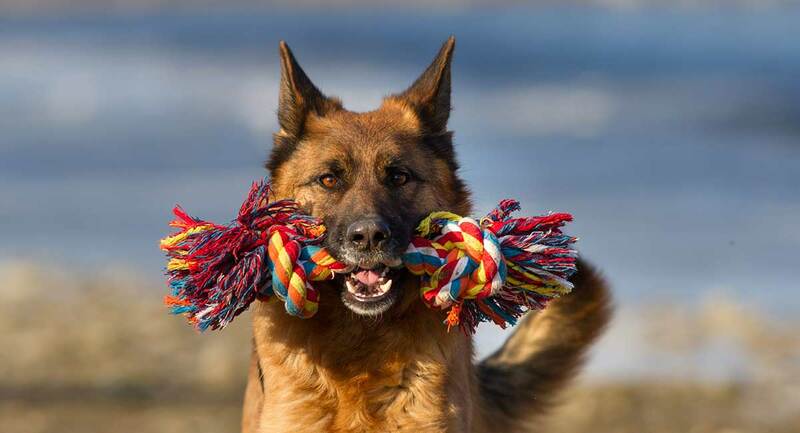 Apart from being fun for dogs, toys make great training aids for German Shepherd Dogs. Especially as training progresses. And especially with dogs that love to interact and play with people. The German Shepherd (GSD for short) is a unique breed known for its intelligence, fondness for play, and a high work ethic. 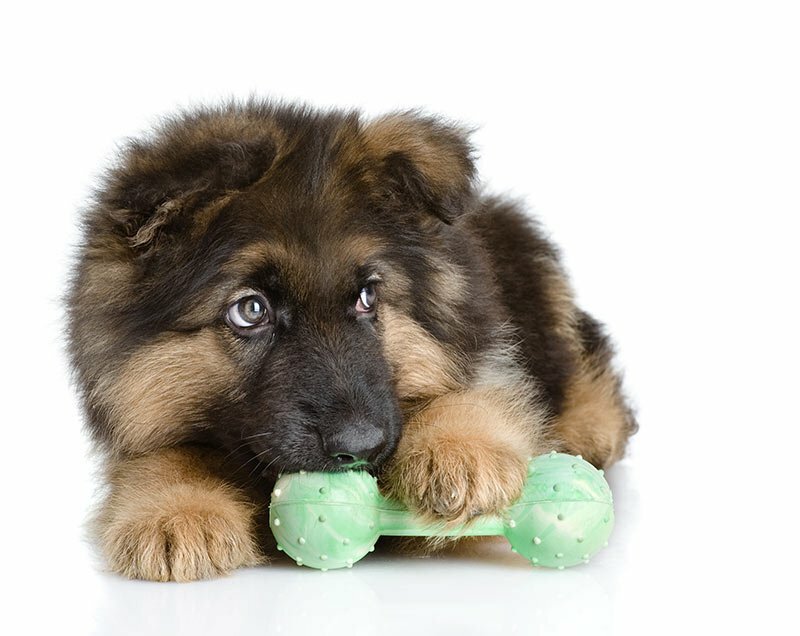 In this article, we’ll talk about German Shepherd toys. Specifically those that are most compatible with the GSD’s powerful jaws and seemingly endless energy. The best toys for German Shepherds are designed for some pretty tough chewing and gnawing, as well as countless games of fetch. This is a large breed with strong jaws and an affinity for playtime. Additionally, since GSDs are herding dogs who love to have a job, puzzle toys and other interactive training-type toys can be just the thing to keep their busy minds occupied. A bored Shepherd without a friend to keep him company or something to keep himself busy can become bored and dejected when left to his own devices. This may make him quite treacherous to your house and property! Shepherds are known to be high-energy dogs that do well with at least a couple of one-hour walks every day. But they really thrive if they can do things that really allow them to stretch their legs. This is where German Shepherd toys that can be tossed, pounced on, and thrown around will come into play. Furthermore, with their love for sniffing out and retrieving things, German Shepherds also enjoy toys that mimic wild game or sticks. Bonus points if a toy floats – Shepherds typically love swimming, so they’ll love a good game of fetch even more so if it involves getting wet! The best toys are the ones that can keep a German Shepherd entertained while he’s at home alone. Also those that he can play with you at the dog park are the ideal choices. As we’ve hinted at a few times within this article, GSDs are big dogs with a big bite! Therefore, the best chew toys for German Shepherds are those that can’t be easily shredded and that are made of non-toxic materials, in case they are accidentally torn. Additionally, chew toys for large dogs should be meant for large breeds, not small toys. Small toys are meant for small mouths, but they shouldn’t be given to dogs that are large enough to accidentally swallow them. There aren’t many toys that are tougher than a KONG! This popular chewable AND bouncy toy is ideal for German Shepherds and other large breeds who chew or aggressively or possibly to relieve anxiety. The black rubber compound is nearly impossible to puncture, making it perfect for powerful chewers. The size Large or X-Large should be sufficient for a GSD. This ultra durable toy is made of 100% non-toxic materials, making it not only strong enough to handle it when a German Shepherd gives it his worst, but most importantly, safe for your beloved fur baby! The highest-grade, heavy rubber ball is practically puncture-proof, but light enough to bounce for days. The ball is about 7 centimeters in diameter, making it about the size of a baseball. Here is a ball that does it all! Bounce? Check! Clean teeth? Check! Dispense food? Check again! This 3-inch toy is also made of non-toxic rubber, and it can be chewed, tossed, batted, and gnawed at in pursuit of tasty treats (either hidden in the center or within the folds of the sides) all day long! In addition to its multi-use nature, this ball is super easy to clean – just wipe with soap and water. Indestructible dog toys are those that are “virtually” impossible for even the most aggressive of canine chewers and players. This means that while it IS still possible for a dog to tear or rip an indestructible toy, the chances of your dog doing so are much lower than they are with average toys. For this reason, indestructible toys are among the best toys for German Shepherds during unsupervised play or relaxation. Indestructible toys are made of very strong material (such as rubber or a rubber compound) that’s not easily penetrated by your dog’s sharp teeth. If there ever was a dog that could use an indestructible dog toy, it’d be the German Shepherd! And for unsupervised chewing play time, we are very happy to recommend the Goughnuts and Kong range of dog toys. The kong extreme mentioned above is one of the toughest toys on the market. But we also love Kong Tires. Kong Tires are great for entertaining power chewers and will grip treats for added interest. There’s also a very tough ball in the Kong Extreme series which even a Shepherd will find it hard to destroy. The Kong Extreme ball will provide hours of fun for your active dog. The manufacturers of Goughnuts toys are so confident that their toys are virtually indestructible, they will even refund your money if your dog makes it through to the inner layer of their famously tough dog chew toys. The original chew ring is another great choice for unsupervised play. For the toughest chewers of all, choose the black version! The GoughNuts Power stick is another virtually indestructible toy from the same range. You won’t go far wrong with either of these two toys. GSDs are very driven dogs whose inquisitive minds may get them into trouble when they’re not exercised both physically and mentally. Fortunately, there are a number of lovely puzzle dog toys that are designed to keep your dog’s noggin stimulated for hours. This is especially nice for days when your pet is stuck indoors for any amount of time. Puzzle toys are designed to create enrichment for your pet by making them search the toy for hidden treats or bits of food, thereby making them also great for use as training aids. For example, puzzle toys might be useful as an early training aid for a German Shepherd puppy who is destined to become a search and rescue dog some day! As its name suggests, the Shuffle Bone puzzle toy features eco-friendly wooden materials and a bone-shaped feeder. Multiple openings hidden beneath sliding disks let your pooch put his mind to work. A task for which he is rewarded with tasty treats or kibble! This puzzle is 12 inches long, making it a decent size for larger dogs. Another wooden puzzle toy by Ethical Pet, this 10-inch circular model features sliding disks and liftable flaps to conceal tasty morsels of your pet’s favorite food or snack. These puzzles from Ethical Pet are both great gifts for dogs that enjoy using their brains! And that includes pretty much all GSDs. This great Flip Board puzzle from Trixie is for intermediate canine players – pups that have already had some experience with puzzle toys. The Flip Board features lids that flip with the use of knobs, disks that slide from side to side, and cones that must be lifted and moved to expose hidden treats. Your GSD will have lots of fun while working for his food (so to speak, of course)! Most puzzle toys involve a bit of a learning curve for your dog. You’ll need to spend some time helping him, to begin with. You’ll enjoy watching him learn as he figures out how to get at his prize! It’s a well-known fact that German Shepherds are known for their excellence in police work. Since they’re highly intelligent and easily trained dogs, GSDs make wonderful police partners and members of rescue teams. Police K-9s are not only used for search and rescue, but also to “sic the bad guy,” sniff out drugs and other illegal substances. Plus many other tasks that human police officers may not be able to do themselves. A German Shepherd who is bound for the K-9 police force some day may get a head start on his education with these toys made specifically for training. This isn’t just any ball on a rope! The Nero ball is a hollow rubber ball attached to a nylon “throw” rope, which makes it easier for you to throw it farther! However, the tough rope also allows you to hold onto it more easily when teaching a GSD to clamp its jaws (and then drop it). This tennis ball-sized toy isn’t meant to be chewed. But you can remove the rope and let your dog safely chew on the ball. (Bear in mind that it may not last as long as a chew toy, considering that the ball is hollow). As its name suggests, this toy is made for tugging! You can use the 11-inch, linen-covered toy to help teach a Shepherd how to tug and let go safely, for training and sporting activities. If you’re not satisfied with the quality of the toy, the manufacturer will replace or refund it at no cost to you. The Kong Training Dummy is used for retrieval training! The bright orange dummy or bumper can be easily spotted from a distance, and its lightweight foam body keeps it light enough to float. This toy would be an excellent option for water training and teaching your dog to soft-mouth carry. Remember to put your retriever dummy away after training – it isn’t suitable for unsupervised play. If you’re looking for the best chew toys for German Shepherd puppies, then you’ve come to the right place! The popular and enduring KONG brand toys, are ideal for puppies who are teething or simply love to chew. Your puppy will outgrow them quite quickly and move on to the full size version. But it is well worth having a couple of puppy kongs ready when you bring him home. Smear a little puppy food inside and pop them in the freezer. Your little one will enjoy gnawing on them, and they will help to sooth his gums while teething. This soft, yet very durable toy is great for puppies who are extra hard on chew toys! A tennis ball with a squeaker ball underneath are covered in high-quality nylon that won’t be easily permeated. Nylon ropes hanging from the bottom make it useful for tossing and tugging. These octopus-like toys are available in small, large, and X-large sizes. Your GSD puppy will probably be happy with the large version. If there was ever an adorable squeaker toy, this one is it! The pig-shaped toy is made of non-toxic material that provides a superior bounce for self-play as well as games of fetch. You can select from pink, purple, orange, or blue – whichever one fits your lively pup’s personality! There are plenty of products and accessories for German Shepherds. Take a look at some of our other guides to make sure you’re completely prepared for your new friend! When purchasing toys for a German Shepherd Dog, small and/or poorly constructed toys just won’t hold up to their strong jaws and sometimes vigorous play. You’ll want to find toys that are made of high-quality, ultra durable, yet impermeable material (such as the rubber compound found in many of the KONG brand’s toys). These will hold up to sharp teeth and tugs of war. Since Shepherds love to run, swim, and otherwise stretch their legs. Swimming is great exercise for young dogs. So you’d do well to buy your Shepherd a really durable fetch toy that also floats. Don’t forget to be careful about the size of the toy that you purchase. Toys meant for smaller breeds may be too small for a German Shepherd. Toys that are small enough to be accidentally swallowed can pose a choking hazard for a large dog, but they may be suitable for GSD puppies. A selection of puzzle toys will keep your clever dog’s brain busy and prevent him getting bored when you spend time indoors together. For those times when you have to leave your dog alone. A really top quality and virtually indestructible chew toy, such as the Kong Extreme or GoughNuts Ring, will help to keep him happy until you return.